Last-minute Christmas shoppers are braving the snow and slush outside. I remain sequestered indoors, braving the labyrinthine folds of my own brain. I nurse mug after mug of rooibos, procrastinate by baking these, distract myself by reading that. I find myself at the interface between two parts of my research, you see, and it has taken the form of a mental chasm I am hesitant to traverse. In reality, I feel most fortunate to have made it this far. New insights into molecular biology are invariably gained using The Scientific Method, and my PhD research has been no exception. The first step is identifying a problem. In my field of study, the problem is that cereal plants manage to protect themselves against the ravages of insect pests, but we don't know how. * The next step is formulating a hypothesis that would address the problem, or some aspect of it. 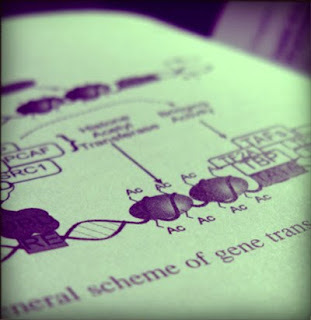 I therefore devised some gene-silencing experiments to test my hypothesis. I spent months in the lab, weeks in the greenhouse and tons of grant money. Most likely, I also inadvertently ate a couple of research subjects (aphids are small). I generated massive amounts of data, crunched the numbers, scrutinized the images, drew the graphs, did the statistics. I spent many hours in helpful discussion with my advisor. And now comes the next step in The Scientific Method: publishing the results. Ever since I was a child, I knew I wanted to help figure out how the world works. I wanted to add pieces to the puzzle, somehow contribute to our understanding of life itself. Today, I'm fulfilling that dream by investigating the wonderfully complex machinery inside cells that help genes to function. Being a geneticist, with a focus on cereal functional genomics, means the pieces I contribute to the puzzle of nature are rather specific. It all seems rather small. I tend to get caught up in the detail of it. The detail is fascinating, certainly, but sometimes it feels kind of trivial, or unimportant. But then I read Michael Pollan, or about Norman Borlaug and the Green Revolution, or about golden rice, or the looming Ug99 epidemic, and I realize that what I do has tremendous value to world food security. What I do will help feed the world. That's enough reason to get the word out and publish that paper. It is the final step to The Scientific Method. It also proves one of the most challenging. Which publication does one aim for? Should I be arrogant and aim for a high impact journal, with a very real chance of being rejected? Or do I aim for more a modest periodical and run the risk of my work falling into obscurity? Judging the worth of one's own research is really difficult, especially when you've been intimately involved with it for such a long period of time. The peer-review system ensures that only science of high quality gets published. It also means that the reviewers can be quite brutal, sometimes subjecting your raw data to a full-on audit, of sorts. So I need to be sure before I submit the manuscript. Was the experimental design inherently flawed? Did I include the appropriate controls during gene suppression? Did I transpose a decimal in a calculation somewhere? 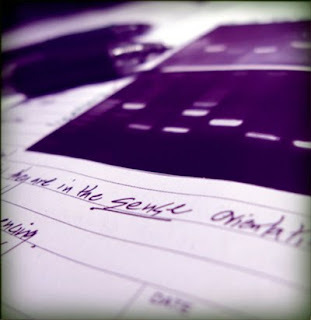 Are the levels of gene expression truly significantly different between treatments? 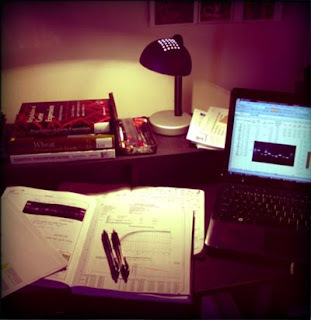 Alone at night, huddled over my notebooks and spreadsheets, there are moments where I doubt myself. This I have no doubt about, though: with the right kind of angle, this thing will go to press. It deserves to. The story must be told. Without the smallest piece, no puzzle is complete. *More specifically, we know that so-called resistance genes allow plants to detect the presence of pests such as aphids, and act accordingly. Cereals like wheat can strengthen their cell walls, generate noxious chemicals like hydrogen peroxide - a sort of natural bug spray, if you will - and even kill off their own cells around aphid feeding sites, thereby depriving the bugs of their food supply. What we don't know is how plant defence mechanisms evolved. Nor do we know how they coordinate this massive reprogramming of their biochemistry. Some crop varieties are very good at it, while others do nothing to stop aphids from feeding on them and eventually just wither and die. We don't currently understand why this is the case. Leon, throw a few teenage vampires into the story and i swear it will go to print! ps. can you spike rooibos with anything? Haha! Thanks for the encouragement: perhaps we can get Robert Pattinson to play me in the Lifetime special when they adapt my thesis for TV... and you can adulterate rooibos with anything: ground ginger and honey is a favourite combo, although presumably even dry sherry would do. Perhaps, to stave of the worrying, you could dust some aphids with confectioner's sugar, dry them inside a little, then put them outside in the Colorado cold. They will turn crunchy and quite delightful. And there I was thinking you had ditched blogging for twitter! Awesome to have you back and Happy New Year my friend. I have *always* had faith in your devotion to science, your ability to write well, and your passion for the big picture. I think you should go for the best publication/publisher you can find. One day you will see your name in print in the journal of your dream. Do not let fear stand in your way. That's a spiraling path you don't want to step onto.